Dell is stepping up their game in the entry-level server tower range with the introduction of the PowerEdge T130 server. This is the next level up from the Dell PowerEdge T20 server offering faster processors, DDR4 memory and all PCIe 3.0 slots for increased throughput. A cabled 290W PSU is standard. Intel's c236 chipset on the Dell T130 tower server supports several processors to support a range of applications, work styles, and budgets. The system supports one processor only and users can choose from four different processor families, including the Intel Xeon E3-1200 v6, Intel Pentium, Intel Core i3, or Intel Celeron. All offer different price points and capabilities depending on your needs. The tower also features a lockable side panel and Kensington lock port to ensure your data, and system, stays put. The single processor supports four memory sockets for a maximum of 64GB using 16GB DDR4 unbuffered (UDIMM) memory modules. Up to 4 x 3.5-inch cabled SATA or nearline SAS hard drives can be installed on the T130 server. With existing supported hard drives, a maximum of 4TB each is supported for up to 16TB of storage with all four hard drives installed. There's also a small space at the top on the front of the system that can be used to install an optional low-profile optical drive. 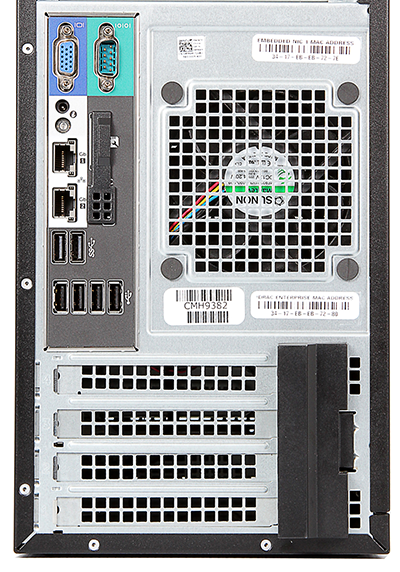 The integrated PERC S130 controller comes standard and supports RAID of 0, 1, and 5. Additional supported PERC9 controllers offer faster 12Gb/s access speeds and a larger range of RAID options. Four PCIe 3.0 slots are supported on the system board and offer twice the data throughput compared to the PCIe 2.0 slots and can be used for additional HD controllers and network interface cards (NICs). Communications are handled by an integrated 2 x 1GbE LOM. There are eight USB ports on the PowerEdge T130 server—six in back, and two up front that support a mix of USB 2.0 and USB 3.0 technology. The T130 server may be an entry-level system, but Dell has bestowed the powerful OpenManage Essentials portfolio of tools for local management. For robust remote systems management, OpenManage leverages iDRAC8 Express with Lifecycle Controller. For more functionality iDRAC8 can be upgraded to Enterprise to activate an 8GB or 16GB vFlash media card reader. The Dell PowerEdge T130 tower server is sized to support small businesses and home offices with a "just right" size for affordability and performance. However, this server still benefits from Dell's exceptional suite of management tools that allow for local and remote troubleshooting, diagnosing, and updating. Low power consumption and quiet acoustics, that won't drive you to distraction, also help to make this server an excellent first choice for a server.